Welcome! 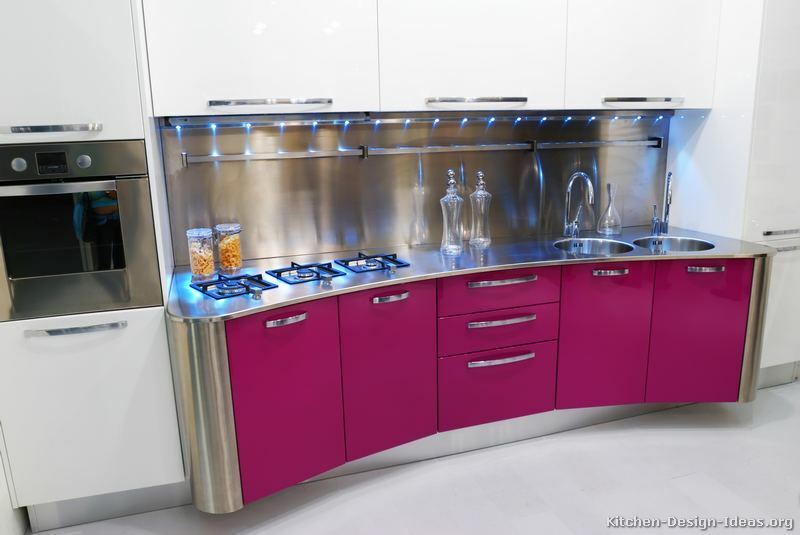 These modern pink kitchens incorporate various shades of the cheery color -- from hot pink hues to baby soft tones -- right into the cabinets, walls, and decor... creating lively designs that get the look! Scroll down to see more. Pretty in Pink: The color pink tends to represent frivolity and love. From light pale shades of pink to hotter hues, nothing quite spells "romantic" like a touch of pink! 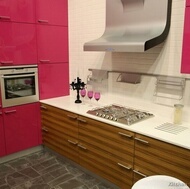 Modern pink kitchens mix fashion with passion, and are very rare indeed. Setting the Mood: As a midway point between red (love) and white (purity); pink is most often associated with new love and innocent romance. 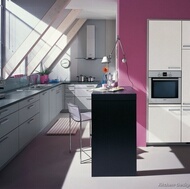 In other settings, however, pink can be either elegant, nostalgic, or energetic. Combined with golden hues, an extra light pink makes for an elegant setting. Mixed with blues and purples, pink can have a more retro or nostalgic appearance. Hotter pinks mixed with reds set a more energetic mood. Because pink can have a psychologically tranquilizing effect, sports teams sometimes paint the locker rooms used by opposing teams bright pink so their opponents will lose energy. 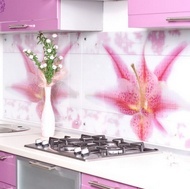 Using pink in kitchens often creates a relaxed atmosphere, as if the color itself were suggesting a playful sense of living in a vacation spot. 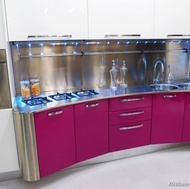 Pink in the Kitchen - Trends: In various forms, pink can be either trendy or elegant. 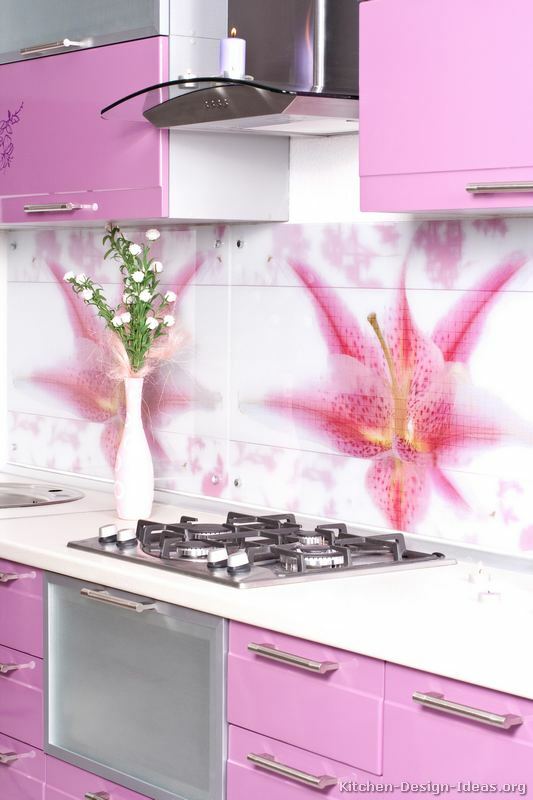 Pink can add a sense of tranquility and romance to the otherwise stark contemporary and modern styles. You'll find a handful of pictures of kitchens featuring pink cabinets, as either the central color or as a contrasting accent in two-tone kitchens. 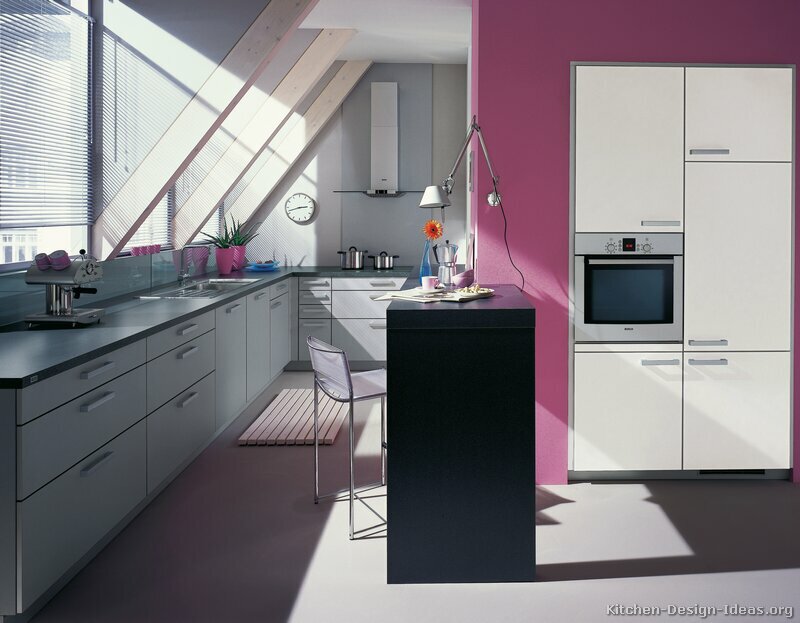 Everyday Use: Pink cabinets require a moderate level of care and attention. Since dark stains and smudges stand out visually on a light surface, pale pink kitchen cabinets may require more frequent gentle cleaning and dusting than mid-toned cabinets. 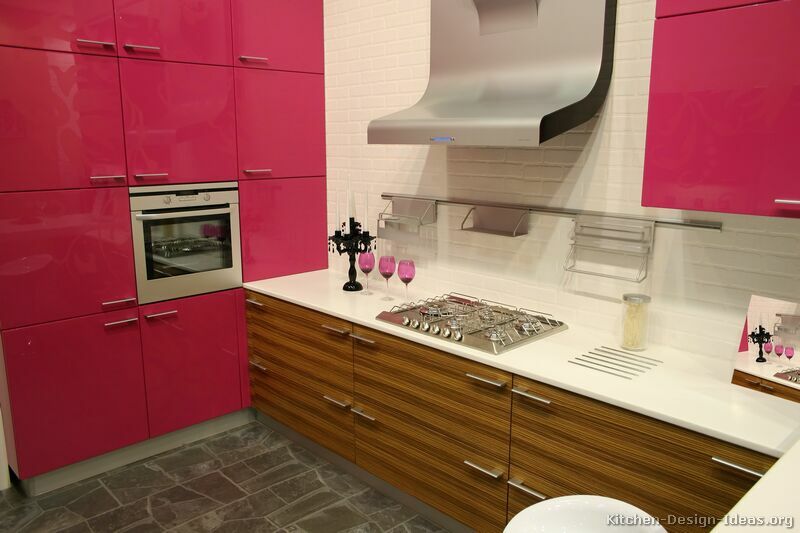 Knowing what to expect in advance can pay off with a lifetime of enjoyment in your modern pink kitchen.